I made this murder mystery birthday cake for a close friend who was throwing his wife her FIRST birthday party ever and wanted to do it big. He came to me and told me that the it was a roaring twenties/murder mystery party. I had to figure out how to bring these two ideas into one cohesive cake. I started out with the basic vanilla boxed cake mix with 3 eggs, 1/4 cup of oil and 1 cup of water. I always use a flour and oil spray in all my pans before I fill them. It makes taking them out 1000 times easier. I put 2 1/2 cups of batter into each 10 inch round, and 1 1/2 cups into each six inch round. After baking at 325 for approximately 25 minutes I test each cake with a wooden skewer. Once the skewer comes out clean I take the cakes out. I then let each cake rest for 10 minutes before taking out of the pan and onto a cooling rack. I made four 10 inch and four 6 inch cake rounds. I like to make one more cake of each size just in case I break one. Its better to be safe then stressed! After they are cooled I place them on a cake board and tightly wrap each one in Saran Wrap and refrigerate them. Two days before the party I began work on the flapper girl materials. I bought a big container of red vines to make the dress and a thin pair of scissors to cut them with. Step one: Cut each end of licorice off. Step two: Cut in half width wise. Step four: put the strands into a air tight container so they don't dry out as you go. I ended up using about half a container of licorice for this cake. I kneaded and rolled out 1/4 pound of white fondant 1/4 inch thick then cut four different sizes using a flower shaped cutter. Using a wine glass I laid the largest into the opening of the glass so it would sink in and get a rounded shape. Then I added each layer on top and let them dry over night. The next morning I painted the flower using red food coloring and then I painted it over with a red gel mixed with silver luster dust. The morning of the party I started putting all the elements together. I started out by taking all the cakes and cutting the tops off of them. I use a cake cutter to ensure all the cakes are cut evenly. For this cake I used 4 containers of store bought white vanilla frosting. I cut each 10 inch cake in half and frosted them inside and out but did not stack them. The six inch cakes were not halved. I frosted each cake and then dirty iced the outside of them after they were stacked. Before rolling out fondant I kneaded each color to soften it so it would roll out easier and was less likely to crack. I used five pounds of red fondant for the first 10 inch tier. I used two pounds of the black for the top 6 inch tier. For the first tier I had to roll out three separate 20 inch red fondant circles and covered each cake individually. The top tier was much easier I rolled out one 15 inch circle of black fondant. The first thing I did was put about three spoonfuls of vanilla frosting on top of the first layer and place the second on top. I then started sticking about a half inch of the licorice strands in between the layer. I repeated that process for the second to third layer. For the top layer I had to make a thick frosting to hold the licorice on the top of the cake. I separated about five tablespoons and put it into a sandwich bag to use on the top of the black cake. Then added two drops of red food coloring to the remaining frosting. I put the frosting into a sandwich bag and cut a small hole at one corner so I could apply the smallest amount possible to hold the licorice. I set the first tier aside to begin work on the second tier. I took the bag of white frosting I set aside earlier, cut a small hole in the corner and drew an outline of a body. I added a little store bought strawberry glaze for the blood effect around the body. Then I put one tablespoon of frosting in the middle of the first tier and put the second tier on top. I put a store bought black frosting border at the base of the second tier using a straight tip. I then wrapped the first tier in a sequin ribbon and fastened with a safety pin. I covered the pin with two fake red feathers and then put the flower I made on top to hold the feathers. I used about a teaspoon of the remaining white frosting from the body outline to hold the flower in place. Using a little bit of the red and black left over fondant I rolled out a long strand together and then used letter cutters to cut out "Happy Birthday Ryan!". I then laid them on the top of the first tier also using the leftover frosting from the outline. 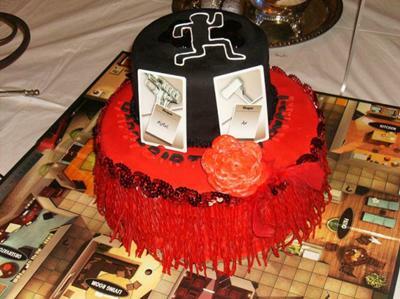 Once I got to the party I opened up the game of Clue that I bought to place the cake on top of. I asked my friend to choose which two clue murder weapon cards to put on the cake. The last step was using two small red fondant balls to hold the cards in place on top of the first tier. Overall it was one of the most fun cakes I've made so far. This cake was a little scary in the beginning because I haven't had any training, but in the end it worked out and I was thrilled! I love it! You did a great job bringing it all together. And I especially love the flapper part! Join in and write your own page! It's easy to do. How? Simply click here to return to Unique Birthday Cake Ideas.